US, 1949, 89 minutes, Black and white. Alan Ladd, Phyllis Calvert, Paul Stewart, Jan Sterling, Jack Webb, Henry Morgan. 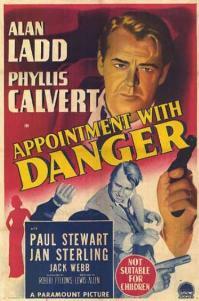 There is a good supporting cast full of character actors as Paul Stewart, Jack Webb, Harry Morgan, Jan Sterling. Direction is by Lewis Allen, director of many thrillers at Paramount including The Uninvited and The Unseen. 1. An entertaining action thriller? Detective story? Religious background? American patriotism of the early '50s? 2. Black and white photography, the locations in Gary, Indiana? The police work, the mail-robbery plans, gangsters' hideouts, the Catholic background? Musical score? 3. The title and indication of action? A routine thriller? Well-paced. well-written, well-acted? Keeping audience interest? 4. The background of police work,, the mail - the semi-documentary tone explaining Americans' reliance on the mail? The context of detection, planned robberies etc.? 5. Al Goddard as the dedicated policeman? His being a loner. his love for his gun, seemingly emotionless? His entry onto the case? Dislike for the murder victim? Quick action in tracking down Sister Augustine? Warming to her? The repartee about guns and guardian angels? His decision to infiltrate the gang? The discussion with Paul Ferrar, meeting Earl and Joe? The persuasion that he was authentic? The police helping? Contact with the police, entry into the robbery? Relationship with Earl's girlfriend? His being discovered by Ferrar, his control of him, the girlfriend's not exposing him. participation in the robbery, resolution of the case? 6. The range of criminals - quick but effective characterisation: Earl and his friendliness. the boss? ice and his violent streak? The murders? Killing George? Attempting to kill Sr. Augustine? Suspicions of Al? Ferrar and his being persuaded to collaborate by Goddard? 7. Sister Augustine - her umbrella. witness to the murder, her pious talk. her sense of responsibility, collaborating with Goddard, repartee, her occupation - a nun of the 1950s? Her being tracked by ice, caught up in the finale? 8. The portrait of the police, police work? 9. Themes of crime, detection, law and order? An effective film of its kind?